Gear up your Pathfinder RPG character in style with this massive 400-page catalog of thousands of magic items, alchemical equipment, weapons, and adventuring gear! Lavishly illustrated with hundreds and hundreds of full-color illustrations and organized in a new easy-to-reference format that groups magic items by 'slot', Ultimate Equipment sorts all magical and mundane equipment released in the hardcover Pathfinder Roleplaying Game line to date with tons and tons of new items to create the most comprehensive treasure resource ever created for the Pathfinder RPG! 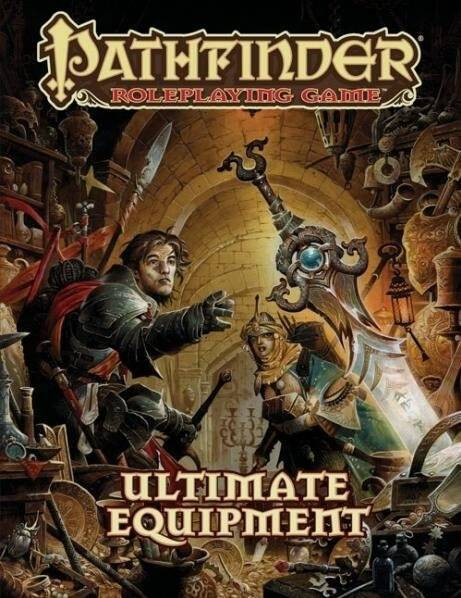 Perfect for players looking to kit out their characters or Game Masters looking to stock a dungeon with appropriate treasure, Ultimate Equipment is an excellent resource for every Pathfinder RPG campaign!